Earlier this week I shared Dr. Katrina Firth’s modified version of the Cornell Method’s Notes Pages. I used the Cornell Notes method in 2013 and really didn’t click with me, so I simply moved on. Had I discovered Katrina’s modified version earlier I probably would have “clicked” with the methodology much faster. Though her modification is basically shifting columns and text around, it really makes the page a lot more appealing and therefore, it’s really much easier to take notes. Dr. Firth uses this modified Cornell Notes’ template to take notes off of her readings (journal articles, book chapters, etc.) She then uses those notes as prompts to help her write. I have a different but at the same time, kind of similar method. My strategy is different because I don’t take notes in the same format or template she does. HOWEVER. 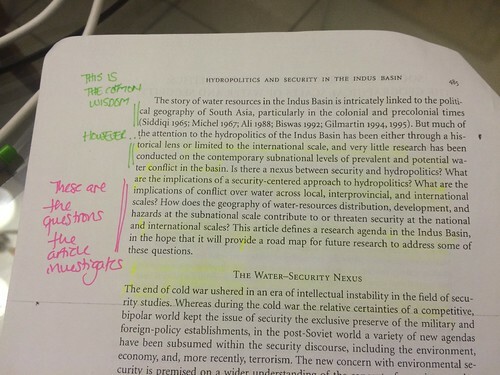 I do take notes off of my readings, and I use them as writing prompts. The method I use to write my synthetic notes is very similar to a shorter memorandum (I’ve written about how to write extensive and detailed memoranda here, but for synthetic notes, I am looking at less than a page, almost like a rhetorical precis). 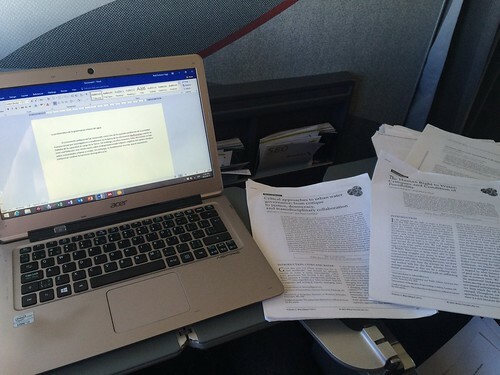 There’s a number of good resources on how to write critiques of journal articles and book chapters, and how to summarize them, but here is my own method. I start by copying the citation (already formatted) from Mendeley on to an empty page (either electronic or in my Everything Notebook). I then proceed with a basic AIC content extraction (Abstract, Introduction, Conclusion). When I extract content using AIC, I don’t overlook the methods nor the data analysis, I simply summarize them, VERY, VERY BRIEFLY. I don’t type the headings “Abstract”, “Introduction”, nor “Conclusion”. I simply write a couple of paragraphs summarizing all the insights I gained from these. 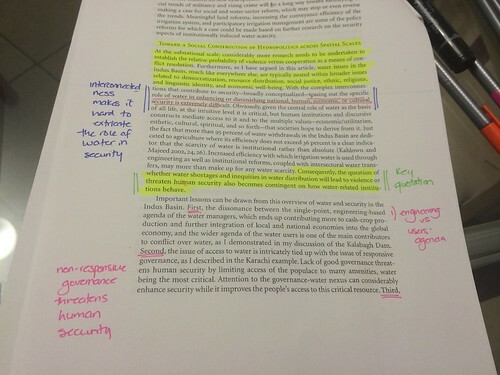 Since I’m very analog, I usually highlight those insights, or I scribble on the sides of the printed reading material. I run through the middle of the paper rapidly (this technique is also known as skimming), and if I find something that catches my attention but I don’t have the time to delve in depth, I attach a Post-It adhesive note that protrudes ever so lightly off of the side of the page. That way, I know that I need to go back to that paper. Since I learn better when I transcribe notes, I often copy verbatim my analog (in paper) synthetic notes off of my Everything Notebook into a digital file (usually in Micro$oft Word). I save the file with a brief summary of the article’s title, usually SN which is shorthand for synthetic notes. I save all my synthetic notes into a folder, which is usually different from the folder where I have detailed memorandums. You should note that if you expand your synthetic notes, you may be able to easily create a very detailed memo. I don’t usually overwrite the synthetic note file, but I make a copy and use that document to expand into a memorandum. 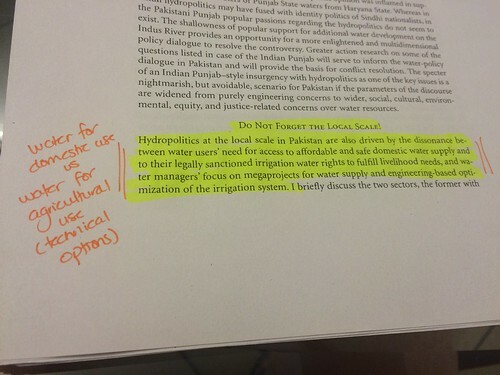 Below you can check a synthetic note of an article I recently read on the social construction of water scarcity. This paper, may be deserving of having a memorandum written about it. Nevertheless, I wanted to assume I was doing a broad survey of the literature and therefore, wouldn’t have the time to really delve into the paper. Below you can see photos of my summarizing (highlighting and scribbling) in each of the AIC headings. Note that I always search the Introduction for the key claims – how does this paper contribute to our understanding of things? How does it shed new light? What kind of counterclaim to the conventional wisdom is the author providing? I ran the AIC content abstraction, and then quickly skimmed the paper. I found two paragraphs really relevant to the paper, so I highlighted those (see photo below). Since I was not doing an in-depth memorandum for this particular journal article (at the moment), I only highlighted those parts that I found were really compelling. 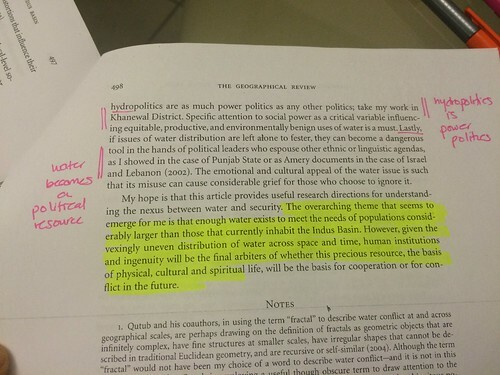 I also added a Post-It adhesive note on the margins of the article (I use arrow-shaped ones) to indicate where I found a quotation that should be included be it in a detailed memorandum or in the Conceptual Synthesis Excel Dump corresponding to the topic (in this particular case, geopolitics of water). Note that when I am not writing a full-fledged memorandum, I still look for key quotations to copy to my Excel dump. This article links several important interrelated themes: the social construction of water scarcity, the importance of understanding cross-scalar dynamics, issues of water security and the link between water governance and security, beyond the traditional understandings of the securitization of water. Mustafa examines the Indus Basin, in particular conflicts of water supply and sanitation in Karachi and the distribution of irrigation water in Pakistani Punjab. A particularly notable element of this article is that goes beyond traditional discussions of geopolitics and hydropolitics that are usually associated with the transboundary water governance literature, and focuses on the subnational scales. 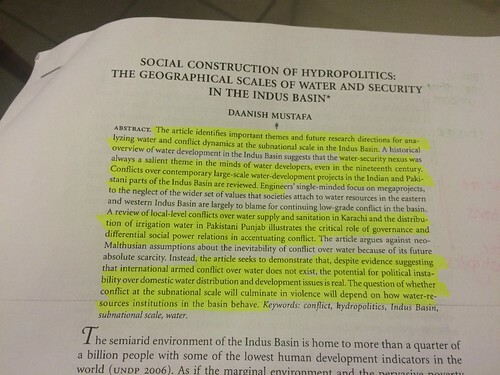 While it would appear to the reader that Mustafa is making yet another case for the water wars literature, instead he specifically focuses on the importance of understanding how water institutions may perform poorly and instead of encouraging peace may exacerbate conflict. Mustafa follows the premise that resource scarcity is socially constructed. He also makes an interesting claim regarding how epistemic communities are more common at subnational scales but they have international ties. Mustafa also challenges traditional engineering-based thinking that focuses on technical solutions to irrigation problems, and instead argues that there is a disconnect between what water users need at the domestic level vis-à-vis water for agriculture (and the construction of mega projects). Mustafa also claims that it is the interconnectedness of water and security what makes it really hard to extricate the role of water in peace building and improving multidimensional views of security. Mustafa draws four main lessons: 1) dissonance between engineering and users’ agendas 2) non-responsive governance threatens human security 3) hydropolitics is basically power politics and 4) water can be a political resource harnessed by politicians to advance their own agenda. As you can tell, I paraphrased text rather than quote. This is important, because I normally copy and paste quotations with exact page numbers both in the extended, detailed memorandum and in my Conceptual Synthesis Excel Dump. For me, synthetic notes don’t have the details I usually would need to write a paper, or a literature review. However, I could very well copy all my synthetic notes on to a single file and create an annotated bibliography. Hopefully this description will help others write their own synthetic notes. This method works well if you apply it in the mornings and write synthetic notes of your readings, or if you are able to devote your buffer day to catch up on reading. Tagged with academic writing, AcWri, annotated bibliography, literature review, synthetic notes.